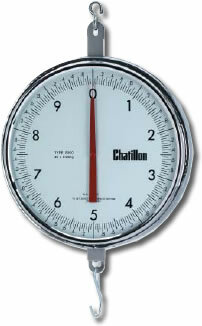 Chatillon 8200 mechanical hanging scales are chrome plated steel for excellent performance even in hot temperatures. With 13 inch glass covered double dial head. Available with below hook or AS pan and available in Class III legal for trade versions. Capacities from 30 to 60 lbs or 15 to 30 kg. The Chatillon 8200 Series hanging scales are constructed of chrome-plated steel with machined stainless steel pinions and phosphor bronze rack combinations for low friction performance even at elevated temperatures. The standard double dial head reaches full capacity in three revolutions. Brass air dashpots eliminate pointer oscillation. Chatillon 8200 series Class III "Legal For Trade" hanging scales are sealable by local Weights & Measures jurisdictions for point of sale use. Tare up to 10% of the dial capacity. Chatillon 8200 Series Hanging Scales - Class III "Legal for Trade"